Did you know that general dentistry plays an important role in the detection, prevention, and cure of many oral health concerns? At Station Square Dental, we offer a broad array of general dental services for all ages, stages and dental requirements. Seeing our dentist regularly is one of the most effective ways that you and your family can achieve and maintain optimal oral hygiene. In turn, this creates a lifetime of beautiful, healthy smiles! 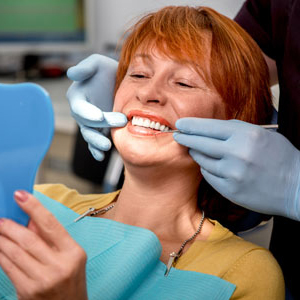 Dental Check-Ups: We recommend patients attend dental exams every 6 months. This allows our dentist to regularly assess your mouth, teeth, and soft tissues for any signs of concern. Teeth Cleaning: Regular teeth cleaning, both at home and in the dentist’s chair, is vital to maintaining healthy teeth and gums. Without proper care, diseases such as periodontitis (an advanced form of gum disease) may develop. Children’s Dentistry: Whether it’s your child’s first appointment, or fiftieth, Dr Ron is very experienced with working with children and will provide the gentle, individualised care they need. Dental Implants: Not all dentists are able to provide in-house dental implants, but thanks to Dr Ron’s qualifications and training within this area, we can offer the high-quality, long-lasting tooth replacement that implants provide. Emergency Dental Care: Dental emergencies can strike at any time, but our friendly team are always here for you. We try to keep some space available in our appointment books every day for patients requiring emergency dental treatment in Oakleigh. Tooth-Coloured Fillings: Dental decay isn’t pleasant, but thankfully, it can be restored. We provide beautiful tooth coloured fillings for a seamless smile. Root Canal Treatment: A root canal is required when the pulp (soft, living tissue) inside your tooth has become infected. Our staff will ensure you remain comfortable and pain-free during your procedure. Tooth Extractions: In some cases, a tooth will require extraction to prevent further pain and suffering. We never remove a tooth unnecessarily and have a range of tooth replacement options available. Wisdom Tooth Extractions: Wisdom teeth can be troublesome, but our experienced dentist is able to extract problematic wisdom teeth before they cause more serious damage. Periodontal Gum Care: Periodontitis is the advanced form of gum disease, causing gum recession, bone loss, and even the loss of teeth. We’ll help to remedy and reverse this condition. Dentures: Dentures are removable replacements for your teeth, designed to look and function like natural teeth and surrounding gum tissues. We provide partial and full dentures. Dr Ron is the first Dental Phobia certified dentist in Australia. He can effectively manage and treat patients suffering from mild to severe dental anxiety. To benefit from our family-friendly general dental services, please schedule an appointment at Station Square Dental today!